When the chill of winter arrives, we are all wont to look for cover and heat. Some of us would like to walk around in a pair of comfortable and warm slippers, while the others might want to crank up the heater a wee bit. If a fireplace is your cup of tea, but you do not want to go through the trouble of stoking the fire and keeping watch over it, then an electronic fireplace will do the trick just nice. 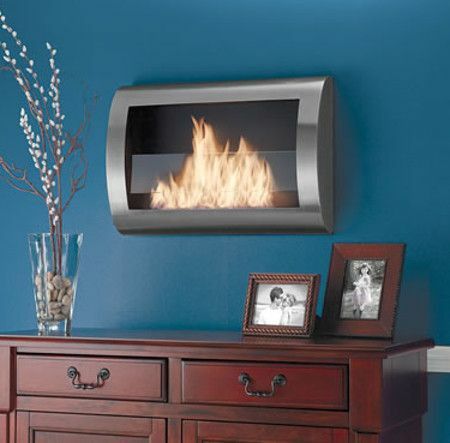 Since you are heading in that particular direction, why not go the whole nine yards with the $399.95 Wall Mounted Fireplace? As its name suggests, this is a liquid-fuel fireplace that can be mounted to a wall to provide the color, charm, and comfort of a wood-burning fire. It does so sans the smoke, smells, or sparks. It will work by using recycled liquid ethanol fuel which gives off only water vapor and carbon dioxide, and this clean-burning fireplace yields a bright yellow, orange, and red 7″-high flame that flickers without fumes, all the while imparting a warm ambiance to a living room, den, or family room. It can generate up to 21,000 BTUs per hour (4,000-8,000 BTUs per hour, depending upon damper setting), heating a 325′ sq. area, and housed within a brushed stainless steel frame that extends only 6″ from a wall, allowing the fireplace’s burner to reside behind a pane of tempered glass that allows its heat to rise through vents in the top without marring a wall’s finish.